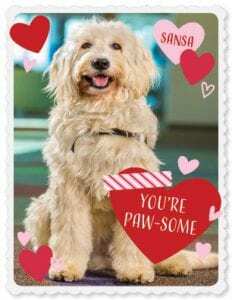 Valentine’s Day is almost here, and you can make it a doggone good day for a Children’s patient by sending a valentine greeting. Visit ChildrensOmaha.org/Valentines and type in a message of encouragement for a Children’s patient. 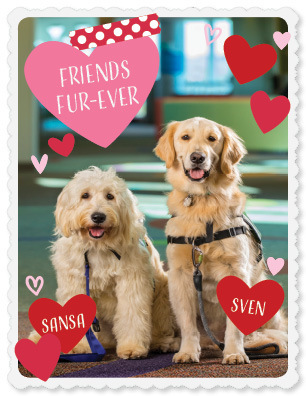 Your greeting will be printed on the back of one of three valentines that feature Children’s facility dogs, Sven and Sansa. Valentines will be delivered to patients on Feb. 14. For each card sent, Marriott Worldwide Business Councils, Greater Omaha/Lincoln, has pledged to donate $1 per card up to $1,000. 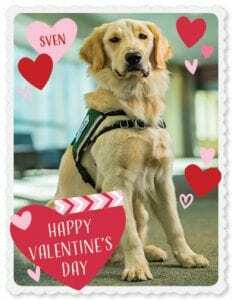 Those who send valentines also have the option to make a donation, and all funds raised through the Valentine campaign will support Children’s facility dog program.